Take a look at these two light sculptures from Guy Marsden. I first discovered his work while looking for unique nixie clocks. In the last few months, he has created two cool light sculptures - Entropy 1 and Entropy 2. Check out the video of them in action after the jump. All photos and videos are copyright Guy Marsden. This wall mounted artwork contains 180 LEDs in a grid behind diffused white acrylic. It is framed in black aluminum. When the red button is pressed on the box below, the whole color field turns red. The color then changes to green, then blue and on through other colors. Each LED changes at a slightly different rate such that they all fall out of phase and "entropy increases". It reaches saturation within about 2 minutes. At this point the whole field is constantly changing color, but it is so subtle that you don't realize it at first. Then you are drawn in to watch the color shifts close up. It is hypnotic. This wall mounted artwork contains 300 LEDs in a grid mounted behind diffused white acrylic. It is framed in matte black acrylic. 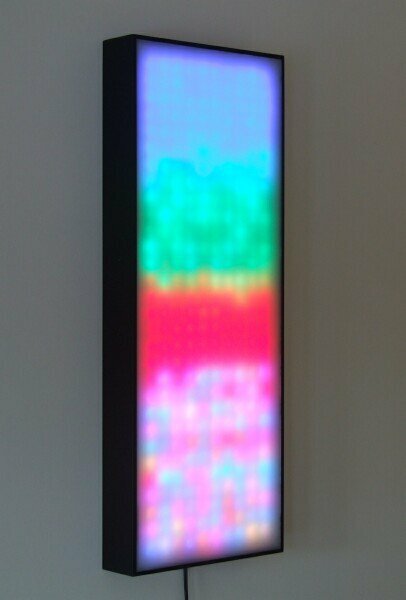 When first powered light begins by scrolling down from the top, filling the frame with first red, then other bands of raw color. The color bands degrade and de-cohere as they progress down over time. After a minute or so the color entropy reaches a relatively homogenous effect and the sequence begins again as solid color bands wash downwards over the jumbled color field.